OS Registry Information - Application installed on Cell phone, User profile, Mobile architecture information etc. Database Information - Database Name, Type, Records etc. File Information - File Name, Size, Location, Creation Time/Date etc. Phone Information - Phone book contact numbers, Text messages, Manufacturer name, Model number, IMEI number, Service provider name, Phone task information, Network status, Battery quality, Picture files and other saved files/folders etc. Please remember: Synchronize your mobile device by just connecting your PDA device with Computer system for transferring the information, files or settings. Synchronization is handled with different applications for Windows Vista and Windows XP or earlier. If your PC is running on Windows Vista, your synchronization settings will be managed through the Windows Mobile Device Center. If your PC is running on Windows XP (or earlier) your synchronization settings will be managed through Microsoft ActiveSync. Extract the detailed information of Windows based mobile phone device instantly. Examines phone information such as manufacturer name, model number, IMEI number, service provider status, saved contact numbers and SMS etc. Analyze OS registry information, database information, file information etc. Automated report generation in TXT or HTML format. Easy to use for technical and non technical users. Fast, flexible, cost effective and reliable tool. 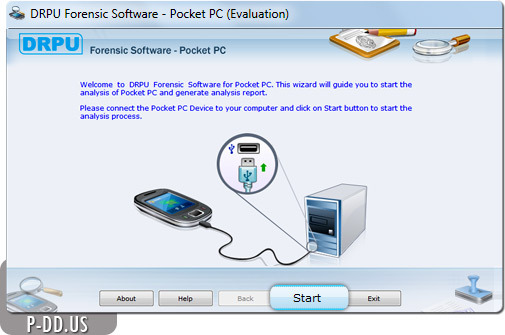 Useful in computer forensic, crime investigation and scientific analysis.